In a country with an abundance of historical and archeological sites, many places get overlooked and others are left to ruin. There isn’t enough money in the Spanish coffers to restore all and even though some 50 million tourists visit Spain every year, many astonishing places are overlooked or forgotten. Living here one gets used to seeing abandoned palaces and remains of regal dwellings and accepting it as the circle of life on the Iberian continent. 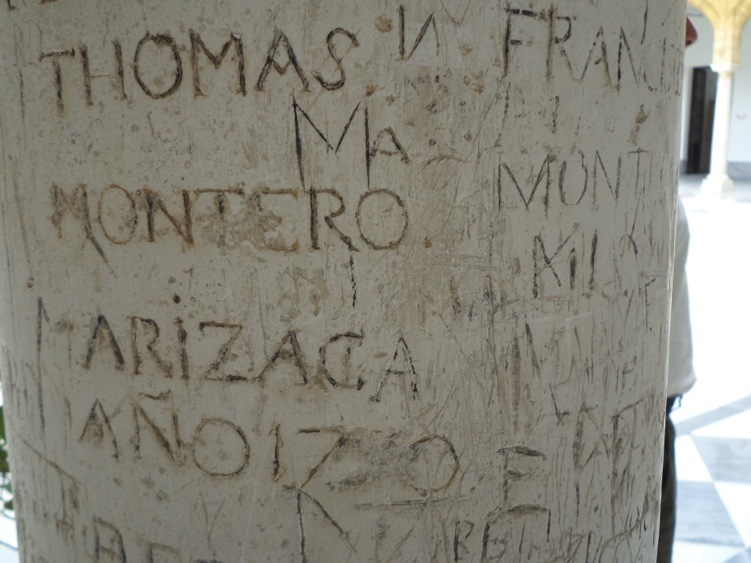 We were invited to visit one of these ‘forgotten’ sites, a small town called Osuna in the province of Sevilla. In Spain small does not have to mean unimportant. With only 17.000 inhabitants, Osuna has seven convents, Spain’s smallest cathedral (hidden underground!) and some twenty palaces. This fascinating ducal town has been declared a historic site, yet hardly anybody visit it and even Wikipedia only offers the town a few pitiful lines. 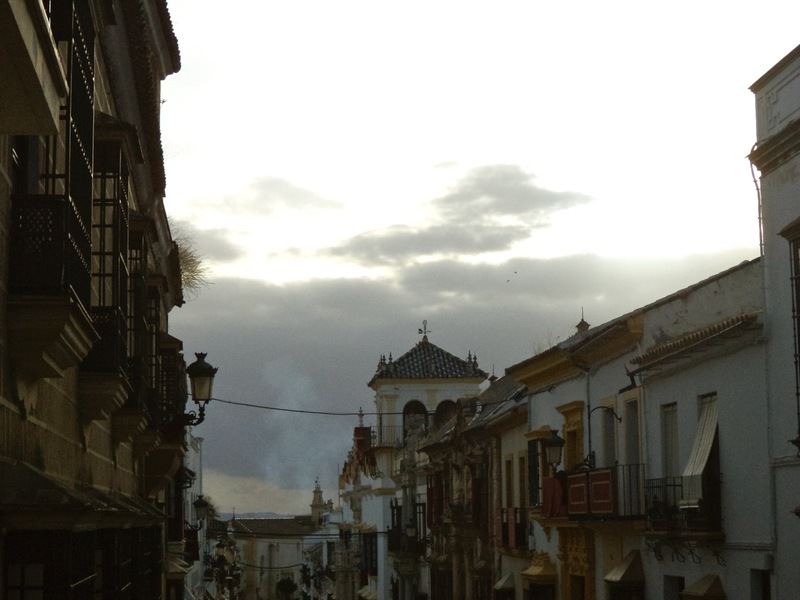 Located a mere hour’s drive from Sevilla or Cordova, we did not hear a single foreign tongue while we were there. Rewind about two thousand years, and Osuna was a major center for the Romans, even casting its own coin. It was also here that Julius Caesar fought his last victorious battle. 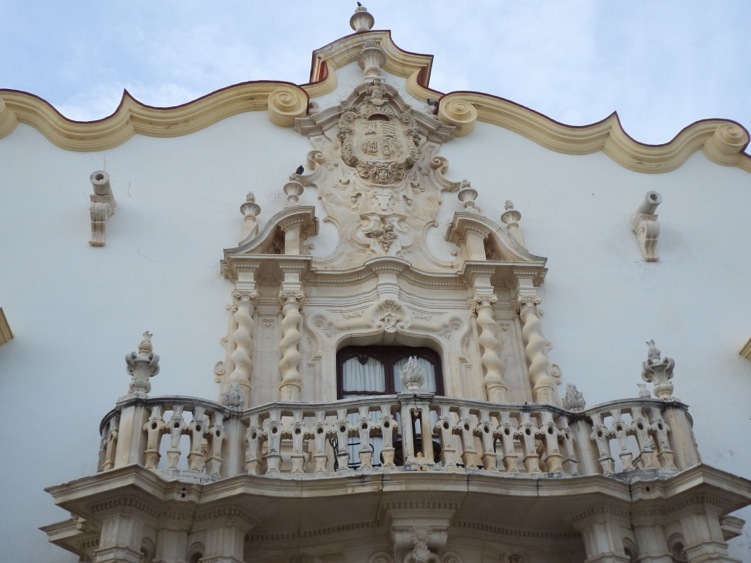 Unfortunately, there is only one building left for the eight centuries of Moorish rule, but in contrast Osuna has plenty examples of the architecture from the Christian re-conquest and the last centuries. The famous Duke of Osuna was not only the town ruler, but at one point owned vast areas reaching as far south as Cádiz. However, as the title passed through the generations, a mixture of inbreeding and foolish spending on war, gambling and personal indulgences reduced the duke’s family to paupers in all but title. Our next stop was one of the monasteries. They had 11 resident nuns, which is a lot for this time and age when young Spanish girls aspire to become anything BUT nuns and unmarried royals no longer have to hurry to get themselves to a nunnery. Beatrice spoke to a nun through a covered lazy Susan type dispenser, where they sell sweets. Most of the sisters are never seen, but two nuns came in the door and greeted Beatrice. She told them of her visiting foreigners who are interested in religious art. The hermanas wished us welcome and told Beatrice that she could show us around. One is really not supposed to take photos in the nunnery, but I was told that as long as I didn’t take photos of all – todo, I would be fine. 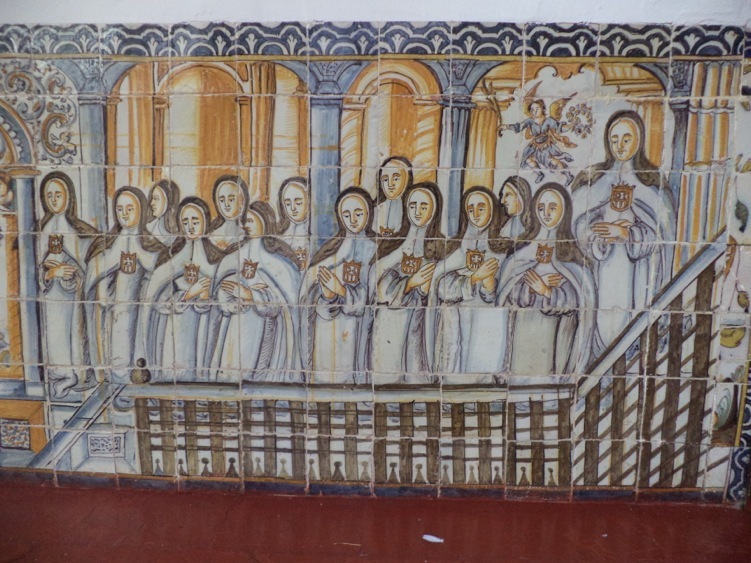 So SpyCam in hand, I joined the others after having snapped photos of the hand-painted tiles surrounding the courtyard – some depicting the indulgences that nuns have to forsake when joining a cloister. Though nuns themselves own nothing, past nuns usually belonged to rich and powerful families who donated religious icons and art pieces to the convent as a sort of payment for taking on their unwanted female offspring. Like a dowry for their marriage to God? Thus, many convents have very valuable religious art. 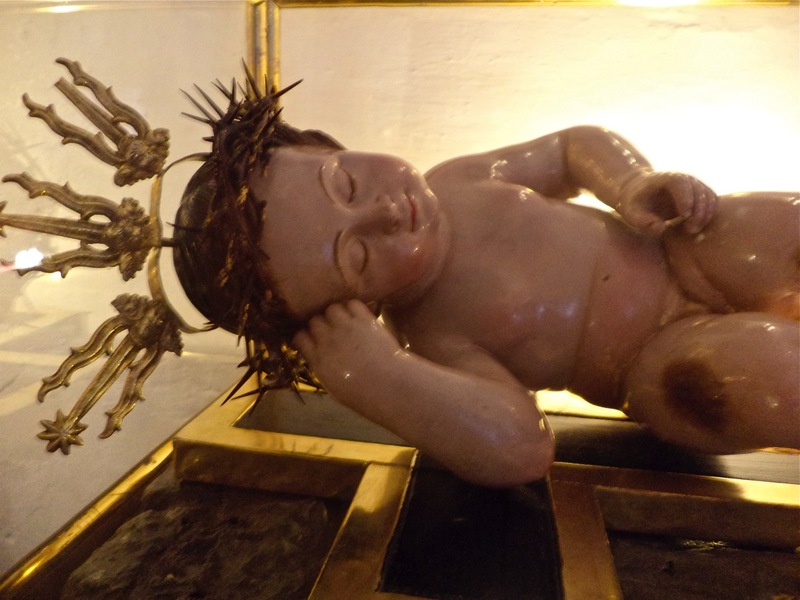 I was particularly impressed by their collection of baby Jesus-es, far angels and virgin dolls, complete with gilded brocade clothing and miniature silver shoes. After a far too copious and wet 3-hour lunch we were ready to hit the sidewalks again, this time for a private tour of the collegiate church. (La Colegiata de Nuestra Señora de la Asunción) erected by pope Paul III in 1534. This enormous and richly decorated building is guarded singlehandedly by Rosario, a feisty and flirtatious 70-year-old lady who has guided visitors through the church for the past 40 years. She picked up a medieval-sized key chain, locked off the church (there aren’t many visitors…) to show us around. 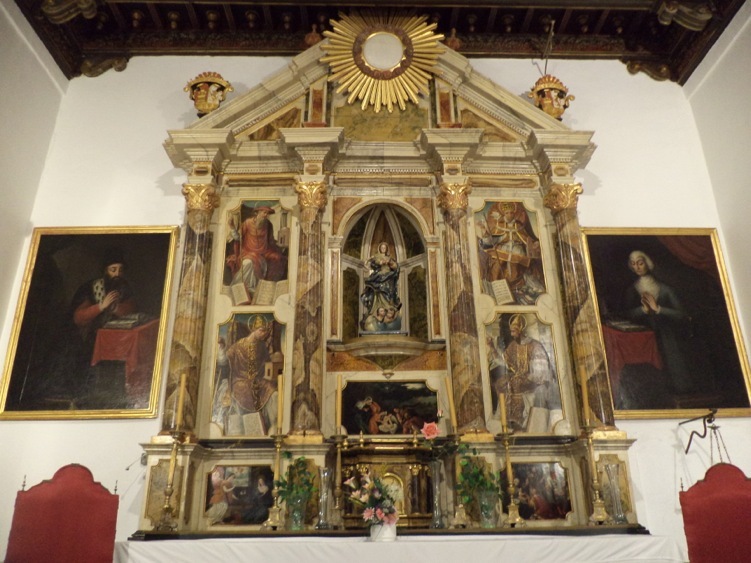 The church has art pieces by Ribera, Osorio, Morales, Zamora and other known Spanish painters. She pointed at one piece, saying it just was returned from a ‘guest performance’ at the Prado in Madrid. 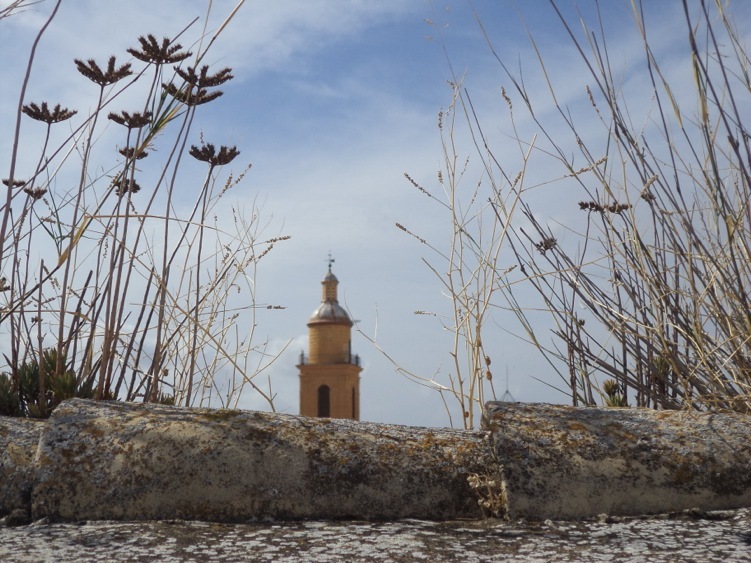 We followed her at harrowing speed in and out of locked doors and climbing down steps beneath the main altar, discovering a real miniature cathedral and yet deeper a catacomb with stone tombs for both clergy and important citizens of Osuna. Our visit was not complete without a walk through the downtown area. The buildings in the center are all form the 16 to the 19-century. Even though they gap over 400 years in time, they present a harmonious blend of bygone times and streets are often grouped by century. Though largely ignored by tourists, Osuna’s uniqueness and beauty is not unknown to filmmakers. In Michelangelo Antonioni’s film ‘The passenger’ from 1975, Jack Nicholson’s character was assassinated in Hotel de la Gloria in Osuna. Franco Zefferelli chose the turret room in one of Osuna’s palaces for his 2001 film ‘Callas Forever’ with Fanny Ardant & Jeremy Irons. Now the best hotel in town, the so-called Marques of the Palacio Marques de la Gomera never really was one, but its wealthy initial owner bought their titles at one point when the ducal family was in need of cash.